RAMBAN: Deputy Commissioner, Showkat Aijaz Bhat today inspected restoration work here at Power Grid Station and Receiving Station, Maitra. He asked the PDD to fix the snag immediately and restore the power supply with without further delay. The DC issued instructions to the concerned departments to ensure prompt redressal of concerns and issues faced by the people post snowfall by providing them uninterrupted essential services. The Deputy Commissioner directed the officers to ensure round the clock monitoring of the situation and keep men and machinery in ready mode to deal with any possible exigency. 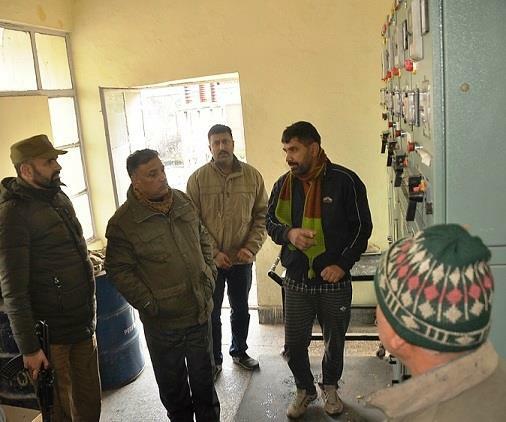 The DC further impressed upon the officers concerned to put in extra efforts for restoration of power supply, inter and intra district road connectivity, drinking water supply, traffic management, operationalisation of heating system in hospitals, ensuring adequate stock of LPG, kerosene and ration for consumers at ration stores. The DC also visited Gandhri, Kanga and national highway and took stock of snow and road clearance operations on the link roads. He interacted with the public at various places and listened to their grievances, besides passing on the spot directions for their redressal. He directed the officers to be proactive and ensure that every possible facility is provided to the masses. He also asked the District and Sectoral officers to personally monitor the field functionaries so that the people don't face any inconvenience.